Goaltending plays an integral part in the Stanley Cup Playoffs. With the competition intense and often so even, the men protecting each goal often are the difference in a series. NHL.com decided to break down perhaps the most interesting goaltending matchup in the Eastern Conference First Round: Jimmy Howard of the Detroit Red Wings vs. Tuukka Rask of the Boston Bruins. Much like many goaltending coaches will do before a playoff series, NHL.com correspondent Kevin Woodley, the managing editor of InGoal Magazine, charted every goal scored against each goalie in this matchup this season and came to some interesting conclusions about their strengths and weaknesses. It wasn't that long ago that Jimmy Howard was the most aggressive positional goalie in the NHL, often coming 5-6 feet outside his crease against the rush. 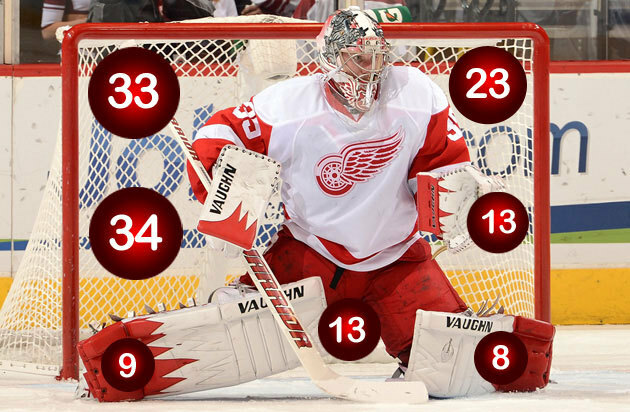 Though he has backed off a little since losing some backdoor protection when defenseman Nicklas Lidstrom retired, the smooth skating that allowed Howard to pull it off remains a staple, propelling him atop his crease and beyond frequently. When he's on -- It looks like Howard is gliding over top of the ice. He makes it look effortless but powerful, beating the play on his skates without retreating too far into his crease, locking in low and wide as the puck-carrier gets closer without committing to his knees too soon, and keeping his hands pressed forward and active. When he's off -- The backward flow that is inevitable anytime a goalie starts as aggressively as Howard off the rush creeps into his game in other situations. He retreats too quickly and loses angle on rush chances, or shrinks back into the blue ice in traffic on end-zone play, dropping his hands and sliding into shots, playing down to his 6-foot size by exposing the top of the net and opening holes. Howard was beaten significantly more often on his blocker side this season, especially at even strength, where 60 percent of the goals went in to his right. Without tracking every shot and save percentage to each location, it's impossible to know if teams were targeting Howard's blocker, but when tracking the shot location of goals, the number that went in from above the right faceoff circle and/or outside the faceoff dot (23) was almost double the left side (12), and more than half of those came on the power play. Far-side rush -- Howard was moving on 74 of 99 even-strength and shorthanded goals, and 21 of 34 on the power play, which isn't a surprise given the flow he prefers to play. But the 38 rush goals at even strength included too many when that backward drift left him slightly off angle and exposed to high far-side goals across his body. Blocker-side high -- Three visible trends emerged that help explain the discrepancy in the number of goals by Howard's blocker. The first two involve how he uses it, including a tendency to leave a little space between his right side arm and body, either by reaching with the blocker or as a result of that forward press that helps with active blocker saves but breaks the arm's seal to the body. Howard will go paddle down on plays in tight and on rebounds, dropping his right-side shoulder to do so, opening more space high. Blocker-side rebound -- The third blocker-side goal trend involves rebounds, which can strand any goaltender who plays the initial shot atop his crease. For Howard, that seemed to mean too many tap-ins, and more desperation headfirst dives back to his right rather than a proper backside butterfly push. Part of the problem seems to be poorer post-save hip rotation on his right, which leaves him pushing flat across rather than pivoting driving back to the post. No angle worth a shot -- Howard plays the puck behind the net from his skates more than most goalies and uses the rebound-producing VH technique (lead pad vertical against post, back pad horizontal along ice) when he goes down on angle shots. That led to 17 goals from below the circles this season, including 13 at even strength. Power up by pushing him back -- Screens weren't a huge issue at even strength (13 of 99 goals), but nearly half on the power play (16 of 34) included traffic that pushed Howard deeper into his crease and forced him to look down and around bodies in front. Tuukka Rask has long been one of the game's best goalies, in large part because he's one of the most mobile, but there are some unique aspects to the way this flexible Finn makes his way around a crease. The biggest is his increased use of a shuffle on even large lateral movements instead of relying more exclusively on the more common T-push. It's a Finnish thing, and it prevents Rask from having to open up his lead leg like goalies using the T-push, allowing him to move while keeping both skates square to the play and therefore change direction again without having to first close off that lead skate. Rask even uses a hop step on big lateral moves, literally bouncing across his crease in a rare but explosive two-step process. All of this allows him to be aggressive and somewhat unpredictable. When he's on -- Like most aggressive goalies, extra movement can cause problems, but Rask is at his best when he's active, attacking angles and engaged on everything, allowing his explosive mobility and active hands to cover off any added exposure laterally. When he's off -- Passive is rarely a word associated with the fiery Finn, but many of Rask's rough patches have an element of casual play. It manifests itself in different ways, from sitting back and dropping his hands into a blocking butterfly, reaching for long shots instead of moving into them, or waiting for the puck to drop on offensive-zone faceoffs before getting set in his crouch. Rask can come across as unpredictable in the way he'll attack saves, but the numbers show a good balance. He gave up 34 goals on the blocker side and 37 on the glove at even strength, and it shifts only slightly on the power play to 17 on the blocker and 10 on the glove, pushing the totals slightly to his right. The origin of shots and deflections were balanced, with the only emerging trends being more rush goals (38 of 115) and goals after he was forced to move (74), with 61 of those coming off one-timers and quick shots. The latter two aren't surprising for an aggressively positioned goalie who has to move more, and quick releases are the best way to take advantage of that extra space he needs to recover. Five-hole -- If there was a surprise for a goalie as flexible as Rask, it was the number of goals that went under or through his legs, with 12 five-hole goals at even strength and five on the power play. Part of it is that explosive back-and-forth movement, which creates a gap as he gathers the trailing leg back in after using it to make a big push. He also tends to turn up his lead toe on an extended leg, which leaves a gap under his tightly worn pads if the shot is tipped down. 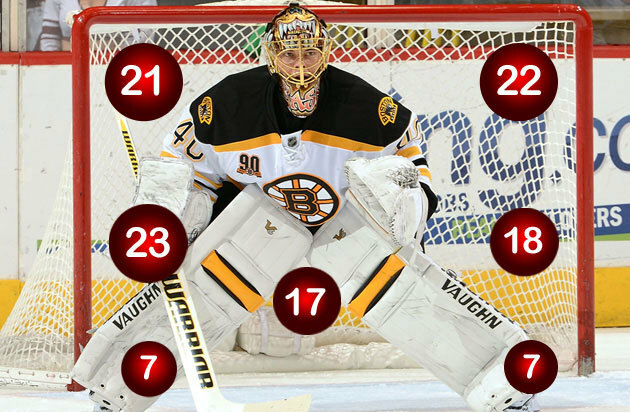 Rask defaults to what is known as a narrow butterfly, meaning his heels fall in behind his knees rather than flaring out wide, which doesn't close the tops of the pads completely in front of his knees and can expose him on five-hole shots and tips. Goal-line bump -- Rask uses this narrow butterfly on dead-angle plays, leaning his shoulder up against the post to get a short-side seal. But when other goalies have the back skate out along the goal line, Rask's is often behind him in the net, leaving him more exposed on pass outs to backdoor plays and deflections off legs in front. Far-side rushes -- It wasn't as prevalent as Howard, but Rask can drift off angle at times as he retreats off the rush, leading to high goals across his body. His aggressive positioning and tendency to push across a bit flat to his blocker side, rather than rotating his hips fully toward the post before pushing, can lead to him diving headfirst to recover after quick lateral passes off the rush. Power up -- The percentages aren't significantly different on the power play, but if there was one trend to explain a slight increase in blocker-side goals it was a tendency to reach with the blocker more than with the glove, which exposes holes under it if the puck is tipped.